Labour president Daniel Micallef. Right: Odette Lewis. An architectural firm co-owned by Labour Party president Daniel Micallef has so far received €30,000 for advice to newly-formed roads agency Infrastructure Malta, the Times of Malta was told. Architect Odette Lewis, who is married to Labour’s organisation secretary William Lewis and is co-owner of his private consultancy firm, was appointed consultant to Transport Malta, paid €35 an hour. They feature in a list of advisers engaged by various government entities falling under the political remit of Transport Minister Ian Borg. 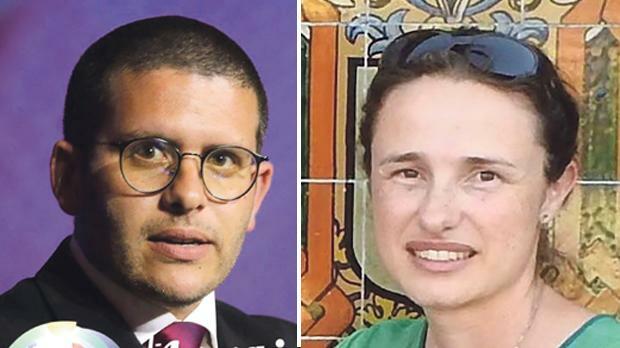 Information tabled in Parliament following questions by Nationalist MP Jason Azzopardi, shows that a number of well-connected individuals, mostly close to the Labour Party, are receiving tens of thousands of euros in consultancies dished out by agencies within the Transport Ministry. The Planning Authority has engaged seven consultants, including Novargo Ltd, owned by Joshua Zammit, a former CEO of Malta Industrial Parks. Striped Sox, a boutique communications agency co-owned by Deborah Grech, wife of Winter Moods singer Ivan Grech, received more than €14,000 in consultancy fees by the planning watchdog. Apart from Ms Lewis, who also sits on the board of the Lands Authority, the transport regulator engaged other consultants. One TV presenter and former Nationalist journalist Karl Stagno Navarra gets €1,500 a month from Transport Malta for advice on communications. Ishmael Psaila, who until a few years ago was an active member of Pulse, the pro-Labour student organisation, is paid €50 an hour also for consultancy. No details were given on the total amount paid so far to the 27-year-old lawyer. The regulator also engages foreign consultants. Dr Borg said in Parliament that Christian Larsson was being paid €2,100 a month for 48 hours of work while Stephen John Oddy was getting €500 a day, including when travelling to and from the UK. Mr Oddy is paid extra fees by Transport Malta for travel expenses and is entitled to €100 daily to cover lunch and dinner if he spends more than 12 hours on the island.